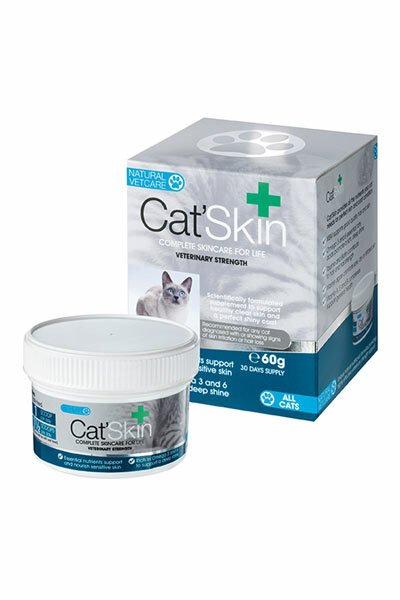 Natural VetCare Cat'Skin is a veterinary strength supplement to support healthy skin and a shiny coat. With its blend of naturally sourced ingredients it supports such skin challenges as itchy flaky skin, hair loss and weak and dull hair. The Essential Fatty Acids promote strong and shiny hair, while bio-available sources of sulphur and calcium give essential nutrients required for optimum hair growth. Taurine is provided as a lack of it can result in hair loss, and biotin is present to support nail growth and strength. Vitamin D is included due to its importance to skin health, which can be lacking if a cat has restricted time outdoors. Yeast product, Calcium carbonate, Methyl sulphonyl methane (104g), Salmon oil, Chlorella (dried, 52g), Calcium hydroxyapatite, Glutamine, Milk protein powder, Seaweed meal, Dextrin. Selenised yeast inactivated (E3b8.10, 2090 mg, 2.08 mg Selenium), Zinc oxide (E6, 4570 mg, 3290 mg Zinc), Biotin (11.7 mg), Inositol (1100 mg), Nicotinamide (1130 mg), Pantothenic acid (1230 mg), Vitamin A (E672, 153000 I.U. ), Vitamin B1 (329 mg), Vitamin B12 (4.9 mg), Vitamin B2 (244 mg), Vitamin B6 (328 mg), Vitamin D3 (E671, 18300 I.U. ), Vitamin E (3a700, 13100 I.U. ), Taurine (17900 mg). Cat’Skin comes in a fine powder which can be easily mixed with wet food. There are currently no questions for Natural VetCare Cat'Skin Supplement - be the first to ask one!